It looks like this relationship just became official, in our world and also the Upside Down. 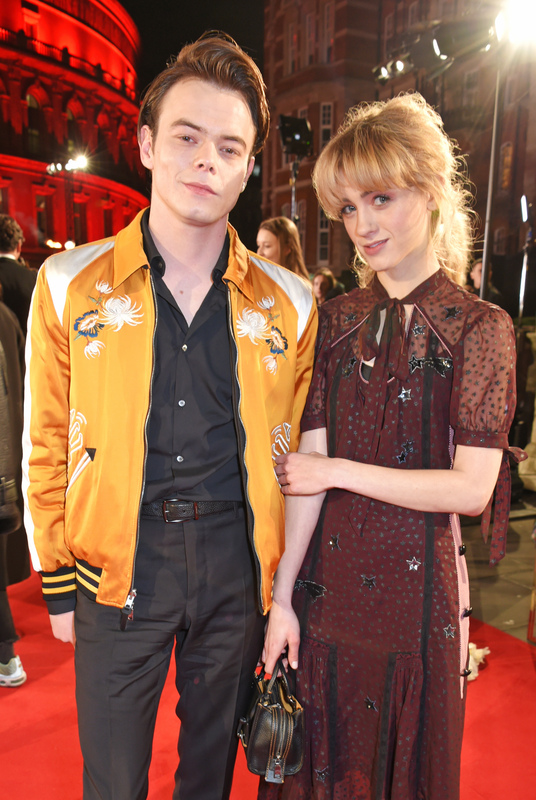 Natalia Dyer and Charlie Heaton have taken their Stranger Things romance off-screen and to the red carpet. Nancy Wheeler and Jonathan Byers’ relationship only just began during Season 2 of the breakout Netflix series, but Dyer and Heaton have reportedly been quietly seeing each other for nearly a year. While the duo have been spotted together all over the globe — strolling through airports, making red carpet appearances with Joe Keery and the rest of the Stranger Things gang, and reminding us that they’re forever cooler than us as they share headphones in Paris — they’ve finally stepped out together for the cameras. Forget Facebook — or Instagram, because it’s 2017 — official, nothing is more important than a celeb couple making things red carpet official. It means things are getting pretty serious. And in their red carpet debut at the 2017 Fashion Awards at the Royal Albert Hall in London, Dyer and Heaton looked like the high fashion couple of our dreams. Dyer, who debuted her new, blonde tresses just before Season 2 of Stranger Things dropped, wore a gorgeous maroon star-printed Coach dress, while Heaton added a touch of color to his all-black ensemble with a bright, mustard colored printed jacket. But the duo weren’t just dressed for high fashion, the also gave the cameras their best Tyra Banks impressions as they opted out of a generic smile for a more high-fashion smize. Okay, so it looks a *little* but more like a smirk than smize but hey, not everyone can be Tyra. The 2017 Fashion Awards appearance marked a red carpet return of sorts for Heaton, who publicly missed the Stranger Things 2 premiere after he was detained at Los Angeles International Airport for alleged cocaine possession as he arrived for the Stranger Things 2 premire. The actor was not arrested but was sent back to the U.K. The duo didn’t just light up the Fashion Awards red carpet on Monday, they made a whole weekend out of their big debut, appearing together at the Burberry x Cara Delevingne Christmas Party on Saturday, looking like a holiday dream. Honestly though, they can definitely teach us a thing or two about fashion. You can throw away that Christmas list because Charlie Heaton and Natalia Dyer’s red carpet debut is the perfect gift. Watch the duo fall in love on-screen in Stranger Things — now streaming on Netflix.